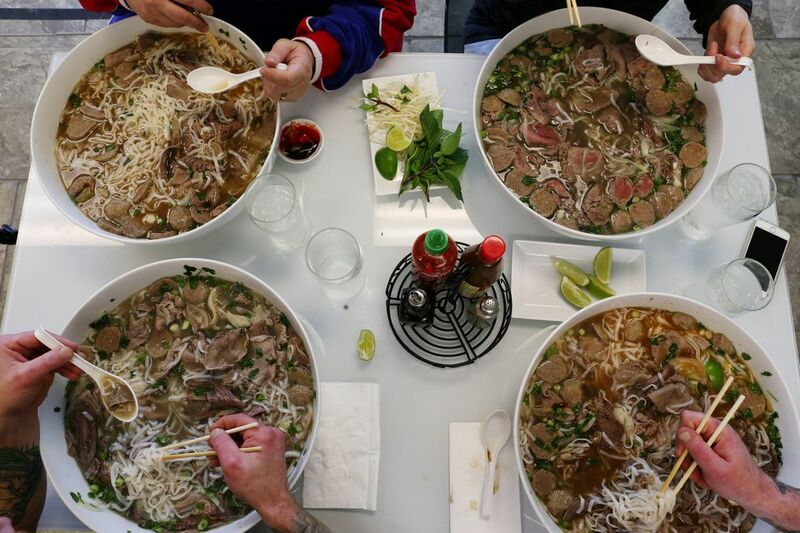 Our hearty contenders try to vanquish massive bowls of pho: four liters of broth, four pounds of noodles, four pounds of meat. Can they do it? Watch our video. Last year, Seattle was in the Super Bowl. Next year, if all is right with the world, Seattle will be in the Super Bowl again. 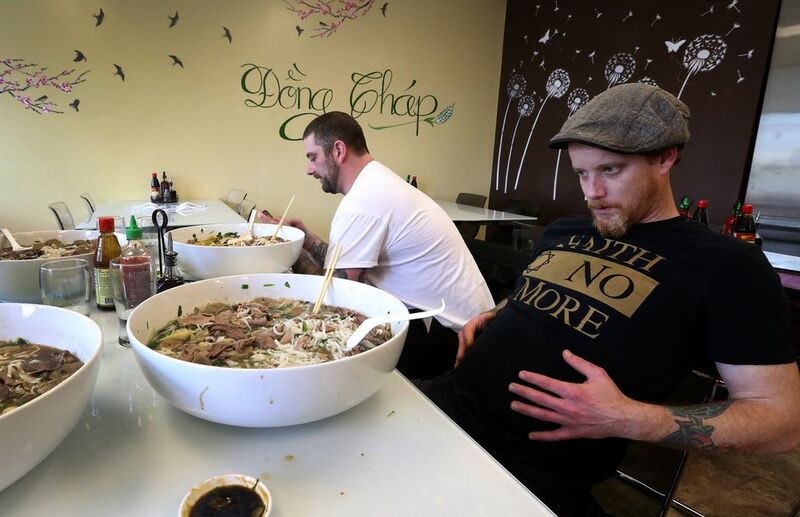 This year, Seattle has the Dong Thap Noodles Pho Super Bowl Challenge: a chance for any one of us to achieve glory by consuming what might be the world’s largest bowl of our city’s greatest soup. Four liters of broth. Four pounds of noodles. Four pounds of meat. A bowl as big as a kitchen sink. An hour-and-a-half time limit. Anyone who bests the Pho Super Bowl Challenge is immortalized on Dong Thap’s wall-mounted flat-screen and receives $100. The price of failure is $40. But it wasn’t about the potential for fame or the lucre in the offing. We took the Dong Thap Noodles Pho Super Bowl Challenge for the Seahawks. We took it for the 12s. We took it for our love of pho, for our love of the game. We took it because it was there. Two people had tried before us. Neither had succeeded. My research revealed that while estimates of the capacity of the human stomach in a state of distension vary, completing the Pho Super Bowl Challenge is not physiologically possible. I did not tell my fellow challengers this. They’d bravely enlisted by saying things like “I’ll give that a shot” in comments on a Facebook post of mine about Dong Thap. The pho shop on 12th near Jackson is more than a gimmicky contest, and, indeed, more than a pho shop: Owners Nick Bui and Khanhvan (K.V.) Tran make all their noodles on-site in an arduous four-day process, and those noodles are arguably the best around. The four challengers: Chef Miles James, former owner of Fremont’s much-missed Dot’s Delicatessen, now at meat-haven Radiator Whiskey; man-about-town Chas Roberts, formerly of T.G.I. Friday’s, now impresario/musician/gourmand/graphic designer; pastry chef Matt Tinder, formerly of the Bay Area’s vaunted Coi and the Restaurant at Meadowood, opening Saboteur Bakery in Bremerton this week; and me. We gathered at high noon. James had breakfasted on Sour Patch Kids, Tinder on honey-flavored Halls lozenges, Roberts on a little yogurt. I’d had two Tums. We’d all had coffee. Both hunger and nerves mounted as we waited. Confidence took a hit at the official weighing of the noodles and meat, held at the counter, as we bore witness to what would go into our bowls, broth aside. Sitting and waiting for the insane quantity of pho to be made, every ding of the order-up bell sounded deeper and more ominous, as other customers happily received their normal-sized bowls during the lunch rush. Tinder stretched his arms and neck, repeatedly looking over his shoulder with trepidation. Ding. Ding. DING. At last, and yet still too soon, four enormous bowls were borne out in succession, owner Bui visibly struggling with their hot sides and sloshing heft. The immense basins of soup steamed. The other diners marveled and took pictures. The 90-minute countdown began. “I’m only here so I don’t get fined,” Roberts said. Tinder — who, with a baker’s precision, had already calculated that we’d each have to engulf 33 grams of broth per minute — rapidly arranged the different components of his pho for some secret plan of optimal consumption, his chopsticks flying. James subjected his soup to an onslaught of Sriracha and plum sauce. Roberts’ tactic was to immediately begin eating all the tripe to get it out of the way, because he doesn’t like tripe. Taking the opposite tack, I dived into the middle of my bowl, prospecting for noodles. Twenty minutes in, only Tinder’s bowl showed a detectable decrease in level. All challengers developed a sheen of sweat. Owner Tran came to the table and reassured us that she was also a nurse, should we need medical help. “Is it getting hard to breathe?” she laughed. We all laughed. “I think mine’s getting bigger,” James lamented approximately 46 minutes in. It was true: In his condiment augmentation process, he’d stirred his pho thoroughly, and his breaching noodles were absorbing broth and expanding. Tinder and Roberts seemed tied, having reduced their soup-volume by maybe a couple inches. My pho appeared untouched and refused to stop steaming. We ate more, slowing down. “I feel like the walls are closing in,” Roberts said. “This is awesome.” He then cursed as more tripe surfaced in his bowl. In the end, our love for pho was undefeated. Estimates for next bowlfuls varied from tomorrow to a few days later. I took home leftovers — a lot of leftovers.